Break the boundaries between time and space. It suit your bag or backpack easily and take it wherever you want. Don't worry about wasting space, great for camping, travel. Bluetooth 4.2 offers stable connection with Echo Dot, connection range up to 99 feet. SPort II MINI will not power off automatically, so it could work with echo dot perfectly. 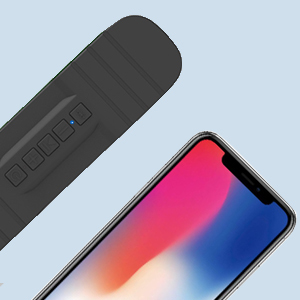 Built-in Mic for handsfree speakerphone calls from smartphones and iPhones, when connected via Bluetooth. Don't worry missing the calls. 1, Q: Is it waterproof ? A: This speaker has IPX4 waterproof and can only be splash-proof. It is not allowed to soak the speaker in water. You can use it outdoors. 2, Q: Does it have an auxiliary port ? 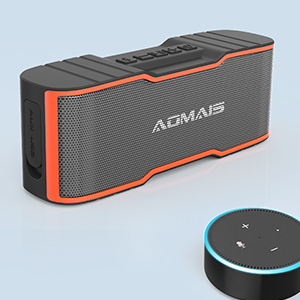 A: This portable wireless Bluetooth speaker has an AUX 3.5mm line auxiliary port. You can use it connect non-bluetooth devices . 3, Q: How long is the Bluetooth connection range for this speaker ? 4, Q: Can you listen to music while it 's charging ? A: It can be used while charging. 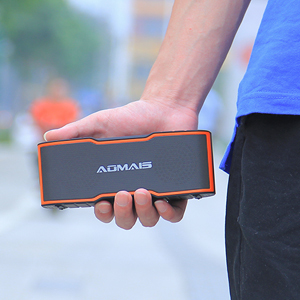 However, it is necessary to pay attention to the use of the speaker during charging, which will damage the battery life to a certain extent, and the voltage will affect the charging time. 5, Q: Does it auto shut off ? A: It has the power-saving feature of 15 minutes of automatic shutdown. 6, Q: What are the main difference between this "mini" model and the normal one ? A: The "mini" version is lighter and smaller ,upgated to Bluetooth 4.2 , and Bluetooth connection range increased to 30m/ 99feet .